Media Mall Factory provides a powerful solution to manage media files online distribution that can handle third party sellers or artists publishing their media or downloadable goods. Having a built-in Credit System authors can earn money from their sale and your website can keep a certain percent. 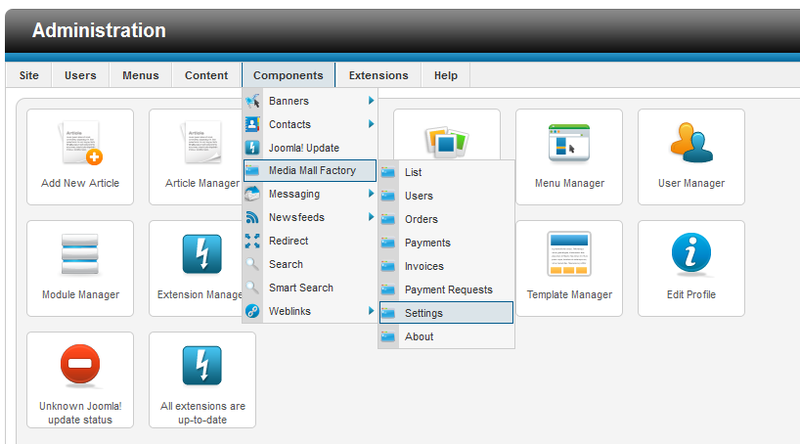 To configure the settings of the Media Mall extension go to "Components/Media Mall Factory/Settings" in Joomla backend. Next, click on "General Settings" to verify and change your component's settings. With Media Mall Factory users can share media files for free, enable the Free media for guests option so that the visitors won't have to register and log in to download the free media. By enabling Approve media all media files shared by the users will need approval from the backend. With Unlimited media views you can allow users to view or download purchased media for an unlimited number of times. 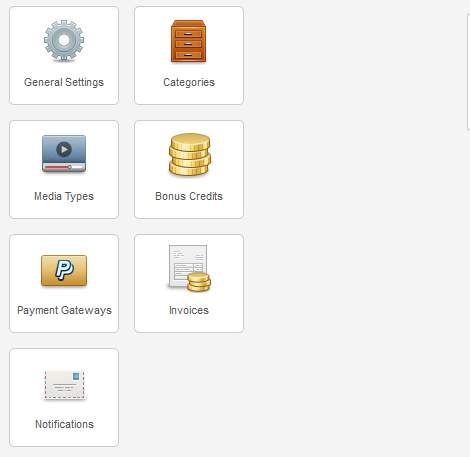 You can enable Category sale to allow users to purchase all the available media files from one category at once. Enter in seconds the View time limit of the media file before the user is extra charged. This is useful for example if the user is watching a video, but for some reason it stopped loading halfway trough it. If the user is in this time limit, he can just refresh the page without being charged an extra view. Media Mall comes with a payment system based on Credits which can be used between users and which can be bought with a defined currency set below. Enter the amount of credits users have to pay when they contact the author of a media file. Add the amount of Initial credits that users receive upon registration. Set the conversion rate from the default currency to credits. You can change the Currency used by users when they buy credits and also the symbol of it. Enabling Generate from media will automatically generate thumbnails for the uploaded images in case no thumbnails are uploaded with them. Add the Quality, in percents, of the generated thumbnails. Define the width for the media small and large thumbnails. 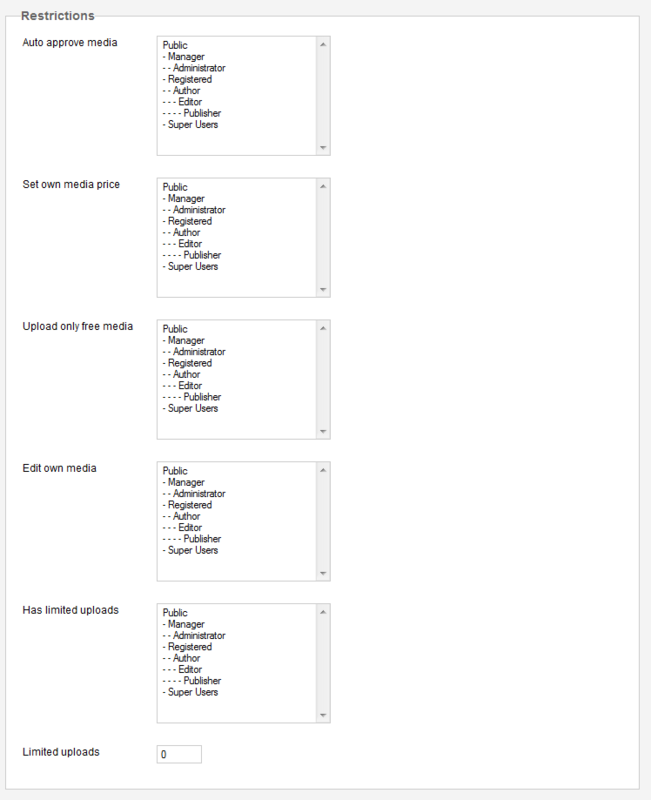 In case you enabled the content plugin you can also set the width of the category thumbnails. Enter how many results will be shown on the dashboard lists. Add a Minimum withdrawal amount of the currency used that the authors can retrieve from their accounts. The website can gain a defined percent of the sales made by the authors, enter here how much they will receive from their sales. Author groups allows you to select from all the available user groups which are allowed to be authors. In this last tab you will find various informations about some Joomla and PHP settings.